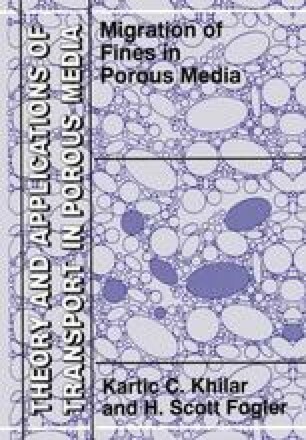 The mathematical models for predicting permeability reduction of a porous medium due to fines entrapment discussed in the previous two chapters fall under the class of continuum models. In a continuum model, the porous medium is treated as a continuum within which quantities such as temperature, fluid species concentration (e.g., ionic strength), and solids concentration are defined as smooth functions of position. The use of such continuum models is appropriate when the porous medium under consideration is homogeneous in terms of the pore structure and the medium surface properties. If the above conditions are satisfied, continuum models are attractive to use because of their conceptual simplicity and their ability to provide useful insight into the process of fines release and capture, and subsequent evolution of the permeability of the porous medium (as seen in Chapters 5 and 6). Of course, the assumption of a suitable relationship between the permeability and the amount of retained fines is necessary. This assumption is typically based on empirical correlations and is a major limitation of continuum models. When a porous medium is spatially heterogeneous, however, it will not be possible to rely on continuum models for accurate prediction of the permeability reduction because the pore interconnectivity, which the continuum models generally ignore, becomes crucial.